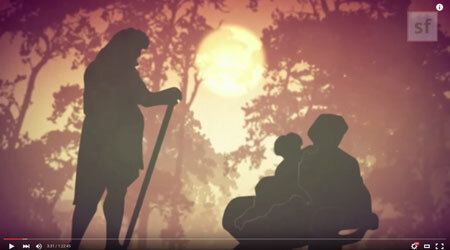 How can we apply the Bible story of Cain and Abel to our modern lives? Swedenborg answers this question in his multivolume work Secrets of Heaven, in which he combs through the meaning and symbolism behind the stories in Genesis and Exodus. 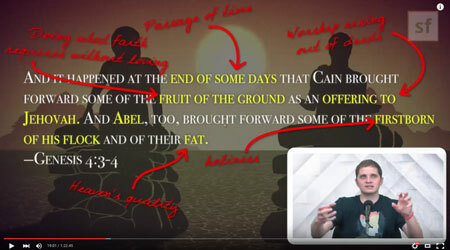 In this episode of Swedenborg and Life, host Curtis Childs takes us through the story of Cain and Abel, examining the symbolism, meaning, and application that Swedenborg finds within each passage of the story. In Swedenborg’s assessment of the Bible story, each character corresponds to an idea, and the journey of that character tells us about that idea through different stages and changes. These concepts change through life, just as characters do. Swedenborg uses these associations or correspondences to explain aspects of human nature. In Secrets of Heaven, Swedenborg writes, “The human and his wife, Eve, symbolize the earliest church.” Here, the word “church” does not refer to an individual building. It refers to a mindset, a group of people who shared the same ideas. Swedenborg harkens back to an idea almost like the golden age, where people have access to heaven and communication with God. At first, this group of people, or “church,” had everything—they could communicate with the heavens and feel that heavenly love. However, nothing perfect can stay perfect, so the golden age began to fall. In this story, the catalyst in the fall was a spiritual shift represented by Cain. Cain symbolizes a shift in thought in this “golden age,” when people began writing down the truth or faith they perceived. Cain represents the creation of a doctrine that can be separated from pure spiritual love. In this “golden age,” people originally just knew how to act and knew what was right without any sort of doctrinal discussion. But after the appearance of “Cain,” people started to drift into a written, conceptual theology and treated the development of theological ideas as something you discover rather than as a universal truth. In that way, they gave doctrine more power than love. Swedenborgian Symbolism: Cain represents faith or truth. (Secrets of Heaven #338). As Genesis introduces a new character, Swedenborg introduces a new concept: love. Abel is Adam and Eve’s second-born or “the church’s second-born” (don’t forget what the first two people represent: the golden age church). As this second-born, Abel represents charity or love (Secrets of Heaven #341). Cain, however, is called a cultivator of the ground, which refers to the “people who lack charity, however attached they may be to a faith separated from love, which is no kind of faith. . . . People whose sights were set on bodily and earthly interests were said to cultivate the ground” (Secrets of Heaven #341-5). A cultivator of the ground invokes a harsh image of digging through the dirt to get food, forcing the ground to produce what one wants from it instead of working with the earth. This concept of removing something from an ecosystem would have been a well-known idea during Swedenborg’s lifetime. At 11:50, Lincoln Smith talks about forest gardens—gardening within the limits of the land and working with the land to keep the forest whole and still benefit from the food it produces. This is in contrast to the idea of Cain cultivating the ground–working within the land is better than taking a bulldozer to it. Without any symbolism, this part is confusing. Those both sound like nice things to give to God—wouldn’t God like both offerings equally? However, in Swedenborg’s symbolism, they represent different things. Cain’s offering represents acting on the right thing without loving other people. On the other hand, Abel’s offering represents everything connected with love, including all the heavenly loving qualities. 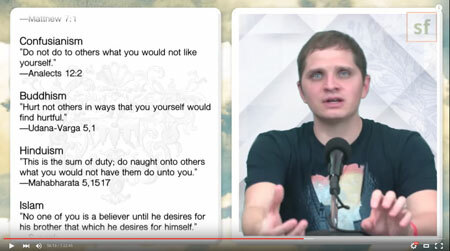 Through these representations, Swedenborg writes that God was pleased by the acts of love, while the acts of faith separated from love upset him. This is not the only place where Swedenborg writes that God dislikes faith without love—Swedenborg often says that truth is nothing unless there’s love to go along with it. With this passage, the tension begins; God likes one brother and doesn’t like the other. Just looking at the characters, it doesn’t seem to make sense—they’re both trying, right? However, with the symbolism, the concepts each brother represents are very different. This passage explains the human tendency to speak of love without acting from love. Cain’s anger holds particular significance in this scenario because it demonstrates that when he pushed love away, he was incapable of acting with understanding and graciousness. At the end of this passage, Abel longs for Cain, meaning the charity longs for the faith to go with it; however, when faith rules over charity, or when ideas are more important than people, nothing can be good. Love needs to lead, and ideas have to follow the love. 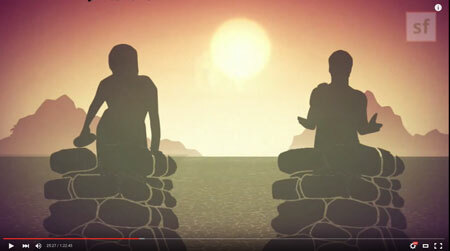 This symbolizes the moment religion–in the form of organized, formal doctrine–killed love. Detached from love, ideas can kill. We can see the killing of love through ideas all over the place, especially in the name of religion. Just think of all the religious wars that have occurred in our history and the ones still being waged today. On a smaller scale, Curtis mentions online bullying, parents judging parents, etc.—all committed by people attached to ideas that stem from love. Love isn’t a thought in Cain’s mind—or love isn’t a thought in the mind of ideas that have run rampant. Detached from love, true ideas find love worthless, because in that state, only the truth matters. This symbolizes an internal realization that something wrong has happened. Guilt sets in . . .
Our true identity comes from love. When we lose sight of that, we lose sight of ourselves and become spiritual drifters. Swedenborgian Symbolism: “Being a wanderer and fugitive on the earth means not knowing what is true or good” (Secrets of Heaven #380). This passage symbolizes a state of internal wandering that leads to confusion and despair. “When we deprive ourselves of charity, we cut ourselves off from the Lord” (Secrets of Heaven #388-9). Being cut off from the Lord is like a spiritual death, having no love from God. It is from this separation of love and faith, Swedenborg asserts, that fear arises. Cain doesn’t die because he’s cut himself off from the Lord, but he does suffer in a personal state of hell since his feelings of happiness come from causing hurt. While religious doctrine has led to death and destruction, there have also been countless benefits and positive outcomes for humanity. That’s why Jehovah saved Cain. He protects Cain with a mark—protecting Cain is worth it, because the truth has to survive. Even though it has the potential for evil, preserving faith is worth it; more good will come out of faith than evil. Cain leaves the land, just as cut-off faith runs from the places where love rules. He builds a city, which represents the many ideas that comes from a single idea—usually in the form of heresies. Cities often correspond with the idea of the mind, especially in the way it is organized. Cain then finds a wife. The wife represents the ideas that come with a false doctrine of life, when one has to start bringing in ideas that don’t come from God, just as the wife comes from outside. Despite the sins of Cain and all humankind, there is always a chance for rebirth. In this story, it comes in the form of a child. Seth comes along and shows that there is a new love. Then, when Seth has a son, people once again start to call on the name of God. Swedenborgian Symbolism: Seth “symbolizes a new faith that will allow charity to take hold.” (Secrets of Heaven #434). What would happen if Abel (love) leads Cain (faith) instead of Cain (faith) killing Abel (love)? In this perfect world, all churches join together into one because there is no doctrinal differences. Faith always follow love, which would act like heaven, working together as a single body to follow God and his commandments as one. Doesn’t that seem like a perfect world?